H.D. Nanayakkara still remembers how his heart sank when he was told their project was cancelled. It would have set a Guinness World Record as the tallest Christmas tree ever erected - standing at a towering 100 metres. The metal, cone-shaped skeleton was to be dressed with green mesh and adorned with an estimated one million red, gold, blue and silver hand-painted pine cones, lit up with some 800,000 twinkling LED lights. A spectacular 20-foot-tall star - weighing some 60 kilogrammes - would have been placed on top. There was even going to be a 20-foot-long Santa Claus figure on a sledge - complete with reindeer right alongside it. The foundations had already been laid; the trunk and the first ring were complete. The giant star lay forlornly propped up near a pile of discarded pine cones. The rest of the tree lay in pieces around the site overlooking the Indian Ocean. Galle Face is one of Colombo's most popular promenades, and people from all over the island of Sri Lanka had been expected to come and admire the tree. Forty-three-year-old Nanayakkara is a prime mover driver for the Sri Lanka Port Authority, and he and a rotating team of 150 other employees have already been at work on this project since August. A small band of workers from the port had first proposed the idea to Arjuna Ranatunga, the country's minister of ports and shipping. Now many, including the port engineers who had offered structural advice, have chosen to work overtime on building the tree for no pay. "We knew even if we cancelled the project at that time, no money would have been saved," Nanayakkara told Al Jazeera. "All the parts were complete; it was only our work left." The news of the cancellation came during the first week of December: A reported comment by Cardinal Malcolm Ranjith, the archbishop of Colombo, had condemned the project as a "wasteful expenditure". The cardinal's lack of enthusiasm for Christmas trees was already well-known: In 2015, an archdiocesan bulletin asked local priests to abstain from erecting Christmas trees inside their churches as it had "no significance to the Sacred Liturgy". "When I heard the news I was upset and asked them to stop building straight away," Ranatunga said. "I am a Buddhist, but since the main leader in the Christian community in Sri Lanka was unhappy, we just had to stop it." When the ministry made the announcement at a press conference, Nanayakkara broke down in front of the cameras. It did not help the situation that the initial cost estimates reported in the press were confused - early reports pegged the cost at around $13.4m, but then in a statement Mangala P Gunasekara, Ranatunga's coordinating secretary clarified that the cost was closer to $80,600. 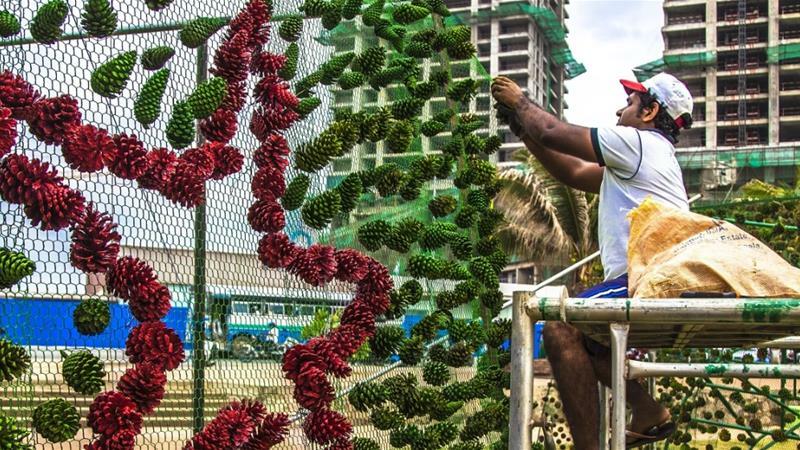 Ranatunga later told Al Jazeera that the government would only release the official cost after the tree was erected, adding that expenses were being met entirely by sponsors and through donations from individuals - not by the state. "Luckily the prime minister [Ranil Wickramasinghe] and the finance minister [Ravi Karunanayake] went and saw Cardinal Ranjith, and after that, we got the green light to go head," says Ranatunga. "The Cardinal would never tell anybody they could not put up a Christmas tree. No one has to ask him for permission. This has been interpreted in the wrong way," Reverend Edmond Thilakaratne, the archdiocesan director of social communications, told Al Jazeera. "What Cardinal Ranjith reiterates is that as we celebrate Christmas, we must always be mindful of the poor and the needy." "I think it was just a misunderstanding," says Ranatunga, explaining that his administration wants to promote interreligious harmony, which includes finding ways like this to celebrate key festivals of all the island's various faiths. He believes this project has resonated with people and says there are so many donations coming in that they are considering redirecting any surplus to the president's National Kidney Fund for patients with chronic kidney disease. Sponsors have been lining up to support the effort. 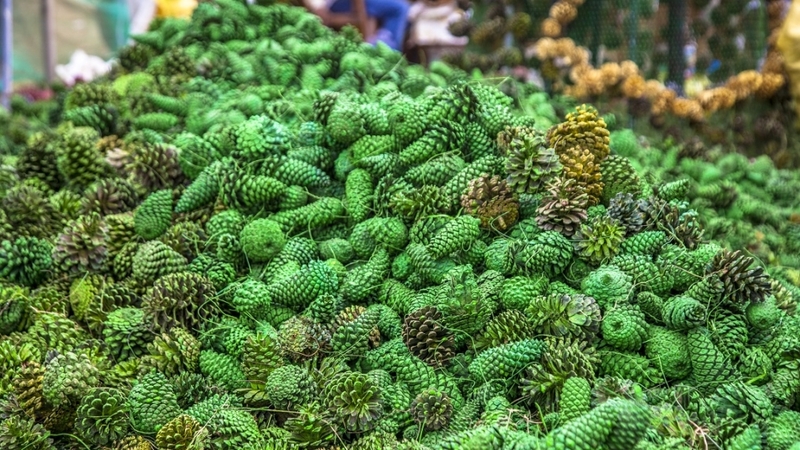 Multilac, a local paint company, is supplying the 3,000 litres of paint needed to cover the pine cones. "We are Muslim, but we still wanted to support what we think is a wonderful initiative that is about unity. For everyone who comes to see the tree, this will be a once in a lifetime opportunity. Sri Lanka is a very tiny country, but that we can do this is a source of pride for us," a member of the company owner's family told Al Jazeera. With the project now back on, Nanayakkara and his team are putting in long hours to have it ready for Christmas, often working from 7am to 1am. The 45-tonne structure - which will utilise an estimated 30 tonnes of iron piping and over 2,500 metres of mesh - is being assembled in parts. A crane was used to winch the lowest and largest ring into place, but now, the men are using a pulley and rope system to lift individual sections, each weighing some 800kg. The tree is so tall that there was some concern that the stiff breeze coming in from over the ocean could tip it over - but Nanayakkara says that he himself designed a system of nuts and bolts in the foundation that would keep it standing straight. 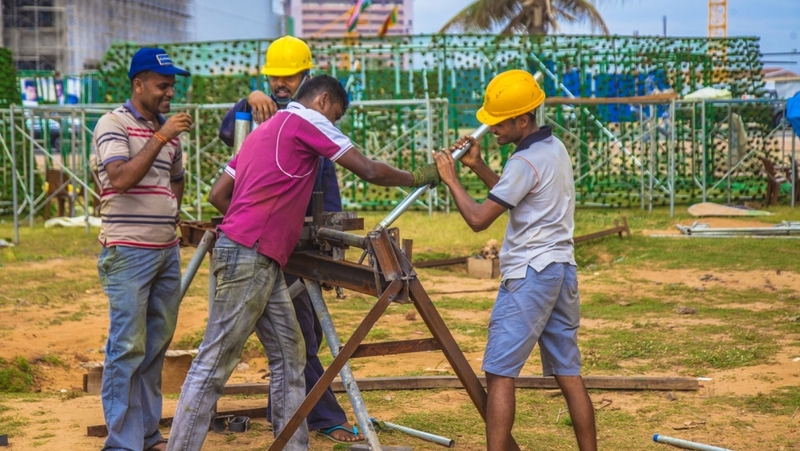 The group of port workers building it are of many different faiths - in fact, only seven or eight of the 150 are Christians, but Nanayakkara says that is the point. He is himself a staunch Buddhist, but he wants the tree to stand as a symbol of unity. "I want to show the world that in Sri Lanka, we are good human beings and that there doesn't have to be ethnic divisions between us," he says earnestly. Nanayakkara thinks such an experience cannot be bought and sees his part in it as a contribution to his country - a kind of legacy that will outlive him. "People think there is some money for us in this, but that is not the case. We have no ulterior motives. Our only objective is to complete the tree." It is a sign highest and strongest Unity of Sri Lankans among all religions.Well done Mr.Prime Minister,Hon.Ports Minister Arjuna , the Port workers and the Donner who bring glorious to this project. God bless. Community unites in assembling the Chritmas tree . 150 people are involved in putting up the tree ..and only a few Christians ..I only feel sad that we Christians all over the world have suddenly woken up to realize that the significance of this day has not reached out to many as a day of the Birth of the Lord .a day we share gifts and glitz and the tinsel is secondary ..SrIlanka is just going with the flow ..all we see is the tall tall Christmas trees all over the world .This is no news if we did not try to enter some silly record but just had fun .inclusive of a Santa a portly one giving presents to kids at Galle face ..wouldn't that be lovely !May be to the Port workers kids at least ..just to be happy that a CHILD WAS BORN .